Tonnages: 12,351 gross 6,185 net 16,450 deadweight. Main Dimensions: 524.6 x 69.11 x 27.6 feet. April 1961: Completed by Lithgows Port Glasgow (Yard No 1128) for Lyle Shipping Co Ltd, Glasgow. Time chartered to British Iron & Steel Co Ltd (BISCO) for 15 years. 1976: Sold to Compania Sydenham, S.A., renamed DAPO WAVE Panama flag. 1978: Renamed EVPO WAVE. Same owners. 1981: April 27th. 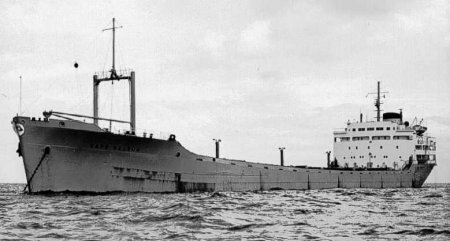 Collided two miles off Demarara with the motor fishing vessel ARENQUE (built 1966 and owned by the Cuban Government) which subsequently sank. 1982: Sold Gurunegala Shipping Co. Ltd. Pothitos Shipping Co. S.A. managers. Renamed CEYLAN WAVE Sri Lanka flag. 1985: March 11th. Ran aground in the Orinoco River off Paramibo whilst bound for Porto Ordaz. Refloated March 20th. 1989: January 25th. Arrived at Chaguaramas, Trinidad after water had entered her hatches whilst outward bound from Mantanzas, Venezuela. Declared a total loss. June 28th, arrived Mamonal, Columbia for demolition by S.I.P.S.A. Columbia. July 20th, work began.